As a top Beverly Hills real estate agent the keystone of Sacha Radford’s success is the relationships and friendships she builds with her clients. She treats each home as her own, her clients like family, and works with total care and personal attention on every project, employing her expertise not only in real estate, but also her passion for artistry and design in preparing a property for the marketplace, or in searching for your dream home in the Beverly Hills real estate market. Her goals are simple: to keep more money in your pocket, and to allow you to rest assured knowing that everything is taken care of. As a Beverly Hills Realtor, Sacha is proud to be a member of The Agency, a respected luxury real estate brokerage that represent properties and clients throughout Los Angeles. The Agency's founding partners, including Mauricio Umansky have been recognized by The Wall Street Journal as the #1 top-producing agent in California and the #3 top-producing agent in all of the United States. The Agency extends far beyond what a conventional brokerage firm offers. It envisions itself as both a lifestyle company, committed to informing and connecting global communities, and as a creative agency. Offering design marketing, sales solutions for buyers, sellers, developers and investors across the globe. Known for her professionalism and aggressiveness as a top Beverly Hills real estate agent, Sacha’s deep love of Southern California lends a definitive passion to her pursuit for your perfect home. Her vigorous response to varying demands has consistently exceeded her clients’ expectations. As a top Beverly Hills Realtor, Sacha Radford derives great joy from helping make her clients’ dreams a reality. Buying a house is a big moment in a person’s life, it is fun and exciting but can be daunting as well. In a perfect world it would be a simple process; someone wants to sell a house and you want to buy it, you pay for it and it now belongs to you. But of course it is never that simple. Besides the many legal aspects of the contract there are other factors to understand and decide upon such as, what does this offer as far as an investment for the future? What are the pros and cons to the neighborhood the home is located in or adjacent to? Are there any other factors that could affect you ten or twenty years down the road? These are things to consider when making a purchase like this. Sacha is an expert in all aspects of real estate, from buying to selling and will help you to the best decision that’ll last you a lifetime. Whatever your taste and style, she will guide you patiently, carefully and expertly through the stunning houses for sale Beverly Hills offers—you will not be disappointed. When selling a house, the number of details can be staggering. It’s critical that your broker has the intelligence, foresight and sophistication to bring you the highest return on your investment. Sacha’s experience and market knowledge leaves no stone unturned in an effort to get you the best price possible which has earned her the reputation as among the best real estate agents in Beverly Hills. Once she’s connected the right buyer to your home, her attention to detail and intimate involvement is intertwined with all aspects of the process, leaving you with an effortless sale. If you’re ready to invest in the very best the Beverly Hills & Los Angeles real estate market has to offer, you’ll need the right Realtor. From shore-side villas in Malibu to opulent estates in Beverly Hills, having a seasoned expert to successfully guide you through this exciting process is crucial. At the heart of the elite Westside real estate market is top Beverly Hills real estate agent Sacha Radford. Sacha has over 17 years of experience in real estate and knows all the ins and outs of buying and selling in Beverly Hills and the surrounding areas. What sets her apart in this field is the care and compassion she has towards her clients. You need an experienced hand and someone trustworthy to guide you in this venture and Sacha has proven time and time again that she is one of the best real estate agents in the business. In fact, Top Agent Magazine dedicated a feature to her saying as much. If you’re ready to invest in the very best the Beverly Hills & Los Angeles real estate market has to offer, you’ll need the right Realtor. From shore-side villas in Malibu to opulent estates in Beverly Hills, having a seasoned expert to successfully guide you through this exciting process is crucial. At the heart of the elite Westside real estate market is top Beverly Hills real estate agent Sacha Radford. Sacha has over 10 years of experience in real estate and knows all the ins and outs of buying and selling in Beverly Hills and the surrounding areas. What sets her apart in this field is the care and compassion she has towards her clients. You need an experienced hand and someone trustworthy to guide you in this venture and Sacha has proven time and time again that she is one of the best real estate agents in the business. In fact, Top Agent Magazine dedicated a feature to her saying as much. As a leader in Westside real estate, Sacha is always adding new listings. She is well known in the area for finding the right home for the right person or family, as well as being able to sell a property in short order. For these reasons she is often sought after by prospective buyers and sellers alike. Sacha has gained a reputation for having excellent listings and superb service. This is why people call her the top Beverly Hills realtor in the business. Browse a gallery of Sacha's hottest current listings and be sure to contact her directly to inquire about exclusive pocket listings or upcoming properties not yet on the market. From Beverly Hills to Brentwood, Marina del Rey to Malibu, there is simply no shortage of exceptional neighborhoods to explore within the Los Angeles luxury band. Use this interactive feature to find the home of your dreams; whether it is a 25,000 square foot Mediterranean estate in Beverly Hills or a modern 3 bedroom luxury rental in Hancock Park, you can find it here. Sacha has exquisite taste and is able to find you the most beautify home available. Click the button below to begin searching for your next home today. The real estate market in Southern California has more pitfalls and complexities then in the rest of the state. It is imperative that as a buyer or a seller, you have experienced support behind you to get the most for your money and time. Sacha Radford has years of experience in real estate law and contracts and uses it to protect her clients fully. She has an intimate understanding of Southern California's luxury communities, combined with her undying commitment to meeting her clients' needs, make her the ideal representative in the fierce world of high-end, Los Angeles real estate. Beverly Hills is the most famous neighborhood in Los Angeles, known across the globe as a luxurious, exclusive community. Among many other distinguishing features, the city is famous worldwide for its zip code – 90210. While the city is a tourist destination, it is also known for retaining a high level of privacy and exclusivity for the people who call it home. Beverly Hills residents come from many walks of life outside the entertainment industry, and choose the neighborhood for its lovely neighborhoods, beautiful homes, privacy, luxury, and the countless amenities the city offers. Beverly Hills is a showcase city of manicured lawns, majestic palms, extravagant gardens, and estates designed by the world’s most prominent architects. It is a city in its own right, with quiet residential areas offering luxurious, private living and a thriving, fun and walkable business district. Beverly Hills is far above the national average in culture, education, restaurants, amusements, and overall quality of life. The streets in Beverly Hills are wider than in other Southern California communities. This allows for pleasant sidewalks, decreased noise, and adds to the charm of the area. Beverly Hills is a small city with inviting shops, cafes, restaurants, exclusive boutiques, health food stores, and offers every option imaginable to residents and visitors alike. The Beverly Hills school system is highly-rated, with several universities located nearby. The city has a great deal to offer culturally, in museums, theaters, symphony, opera, and ballet. As the city you call home, it offers a stimulating lifestyle for people of all ages. Some of the most sought-after properties in Southern California are located within the City of Beverly Hills. From smaller homes and condominiums to expansive, gated estate homes, luxury properties abound in this exclusive neighborhood. Estate homes in the area are examples of stunning architectural design, and the business district showcases world-class restaurants, shops, and hotels. Real estate within Beverly Hills is a reflects the unique character of the city. Purchasing property in this exclusive neighborhood can be an intriguing investment opportunity, or bring the lifestyle opportunities in a vibrant city that more than lives up to its reputation. Also known as the Pink Palace, the Beverly Hills Hotel is an icon. This beautiful luxury hotel has been a setting for Hollywood stars and celebrities for a century. Remaining faithful to its original architecture, the hotel has been renovated, and continues to offer an extraordinary level comfort and flair. Located on Sunset Boulevard in the center of Beverly Hills, this 5-star hotel is surrounded by 12 acres of lush gardens. Located a few blocks from Rodeo Drive in Beverly Hills, the Spadena House, popularly known as the Witch’s House, has caused many passersby to do a double-take. Known for its fanciful, intentionally dilapidated design, this converted private home features tiny windows, a pointy, lopsided roof, and stucco with a distressed paint. It is surrounded by an overgrown, English-style garden and a pond that resembles a moat. 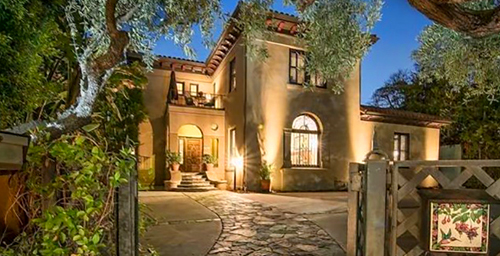 Located at 905 Loma Vista Drive, the historic Doheny Greystone estate is owned by the City of Beverly Hills. The original proprietor was Edward Laurence Doheny, one of the first to strike oil in Los Angeles in 1892. Construction of this palatial manor home began in February 1927 at a total cost of more than $3 million for the entire estate – an unimaginable sum in the 1920s. The Saban Theater is an art deco structure at the corner of Wilshire Boulevard and Hamilton Drive in Beverly Hills. Designed by architect S. Charles Lee, this building is a classic Los Angeles landmark, listed on the National Register of Historic Places. It opened originally in September 1930 as the Fox Wilshire Theater. If you are searching for, buying, or selling property, the importance of having a knowledgeable realtor in Beverly Hills to represent you cannot be overstated. You need a real estate agent with extensive experience and deep contacts within the Beverly Hills community. At Sacha Radford Properties, you will find Beverly Hills realtors who will work with total care and personal attention to your desires and interests. Sacha Radford is a top Beverly Hills real estate agent whose success is based on the friendships and relationships she builds. Known for her professionalism and aggressive representation as one of the premier real estate agents in Beverly Hills, Sacha Radford has two simple goals: to keep more money in your pocket; and to provide the kind of service that gives you total confidence that your transaction is in the hands of a true real estate professional.